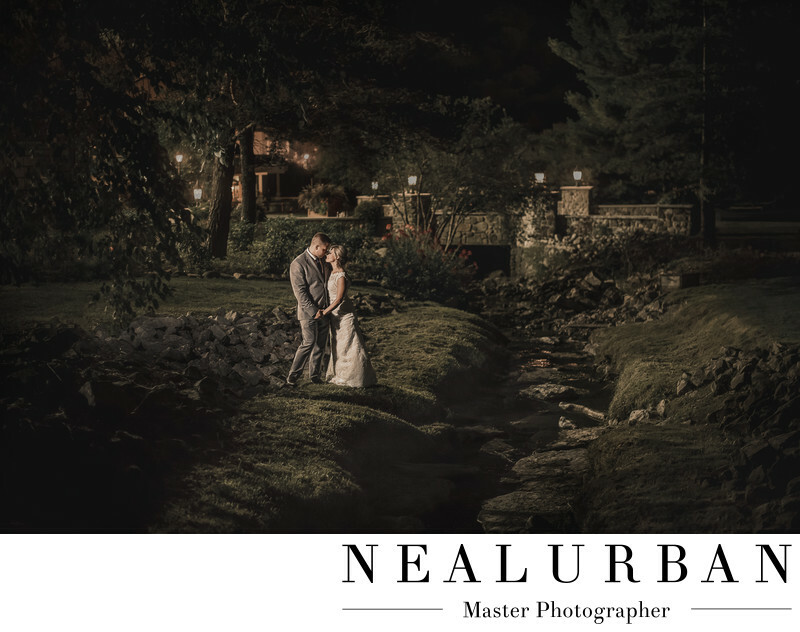 Gus and Balon had their wedding ceremony and reception at Holiday Valley Resort in Ellicottville, NY. The ceremony was outside in a courtyard. Then the reception was in one of their giant lodge style banquet rooms. Once we arrived to the Resort, we did not have to leave. They wanted everything done there. Perfect! After the ceremony, we took the bride and groom and wedding party around the grounds. Then sent the wedding party into cocktail hour. We worked with Gus and Balon for a few minutes before we had to get them inside for introductions. Since we did not have a lot of time, we wanted to get something amazing for them later in the night. Neal always leaves the party for a few minutes after all of the first dances are finished. He likes to walk around parts of the venue for ideas for end of the night photos. He cam back in and told me he found a great location outside for Gus and Balon. He took a photo and showed me. All we needed to do was grab the lighting and the bride and groom! We brought them out and they loved the location. It was not a far walk at all from the venue either. We set up the lights and posed Gus and Balon. Instead of arms around each other, we hand them hold hands lower to their bodies. I loved this pose! Gus is super tall, so this worked out best! I was standing with some lighting on the front of the couple. There was enough light coming from the little outdoor lamps, that we did not need anything else. In the initial image, I was in the photo with the light. I had to be photoshopped out. That sometimes has to happen to get the best lighting. We got this done in no time and had the bride and groom back into the dance party. Neal and I took a minute and stayed outside to look at the photo out of the camera. At first look, it reminded me of a scene in Ireland. It looked like something on castle grounds. Not that we have ever been there, but the it looked like something from the travel channel! We knew Gus and Balon were going to love this! Location: 6557 Holiday Valley Rd, Ellicottville, NY 14731.